* NDIR method principal for CO2 ( Carbon dioxide ) Operating Main instrument : Less than 85% R.H.
measurement, available for long term operation. Humidity C02 probe : Less than 85% R.H.
* High repeatability and high accuracy. Humidity probe : 0 to 95 %RH. other probe is for Humidity/Temp./Dew point or equivalent. * Separate probe, easy operation and convenient Approx. DC 9.6 mA for 90% period. 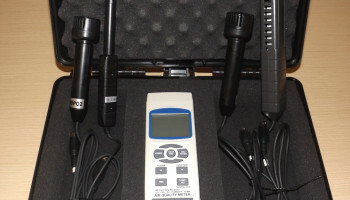 for remote measurement. Approx. DC 128 mA for 10% period. * Humidity measurement with fast response time. Approx. DC 5.6 mA. * Large S-TN LCD, high contrast, easy readout. Weight Main instrument : 372 g/0.82 LB. * Data hold function for freezing the desired value @ Battery is included. on display. CO2 probe : 158 g/0.35 LB. * Records Maximum and Minimum readings with Recall. Humidity probe : 82 g/0.18 LB. @ Depend the environment air dioxide ) * ≦1,000 ppm. Humidity/Dew point : * > 1,000 ppm ≦ 3,000 ppm. circulation. * ≦ 3,000 ppm. CO2 altitude 0 to 9,000 meters. Range 0 ℃ to 50 ℃,32 ℉ to 122 ℉. setting Accuracy ℃ - 0.8 ℃, ℉ - 1.5 ℉. ℃/℉ setting Range 10 % to 95 % R.H.
Auto power off enable/disable setting Humidity Resolution 0.1 % R.H.
Data Hold Freeze the display reading. ± (3% reading + 1% RH). Display Approx. 1 second. ± 3% RH. Sampling Time Range 0 ℃ to 50 ℃,32 ℉ to 122 ℉. manual off by push button. Accuracy ℃ - 0.8 ℃, ℉ - 1.5 ℉. Data Output RS 232/USB PC serial interface. USB-01 will get the USB plug. ℉ Range -13.5 ℉ to 120.1 ℉. Probes no. Two probes : Resolution 0.1 ℉. * Probe 2 is for Humidity, Dew point. Humidity/Temp. measurement automatically. Operating 0 to 50 ℃. Humidity & Temperature measurement..